Once upon a time in the not so distant past, people asked their friends and colleagues for recommendations regarding everything from plumbers to restaurants. “Hey, anyone got a handyman?” you’d say, and someone would scribble down a phone number and slide it over. This still happens, of course, but in today’s “Just-Google-It” world, our circle of trusted referring folk includes the entire planet. We want a restaurant, we go to Yelp. Backyard need sprucing up? Try Angie’s List. The number and popularity of websites dedicated to crowd-sourcing reviews is growing. Google is also in on the act. Its star ratings appear right in the search results and influence which links consumers click. The upshot: If your company reputation is not promoted online, then you are losing out on potential business. Word-of-internet is the new word-of-mouth. What people say about your company online can and will affect your profits. We outline below how to improve business, utilizing online reputation management. How’s your online company reputation? According to a 2014 online survey by BrightLocal, 88% of consumers trust online reviews—that’s almost everyone. Plus 40% of those consulting online reviews form their opinions of a company after reading only three entries. That means you have little time to forge a positive first virtual impression. When there’s fierce competition for your product or service, consumers’ initial reactions to your company can be critical to your revenue. That’s why a savvy marketing strategy for managing online reviews should be at the top of every company’s “To Do” list. ACS can help with the ins and outs of creating a lead-generating company reputation online. After all, developing marketing strategies for small businesses is what we do. How to improve business with stars. Or thumbs up or little smiley faces or whatever other icons review sites are using these days to let the world know your company is worth a try. 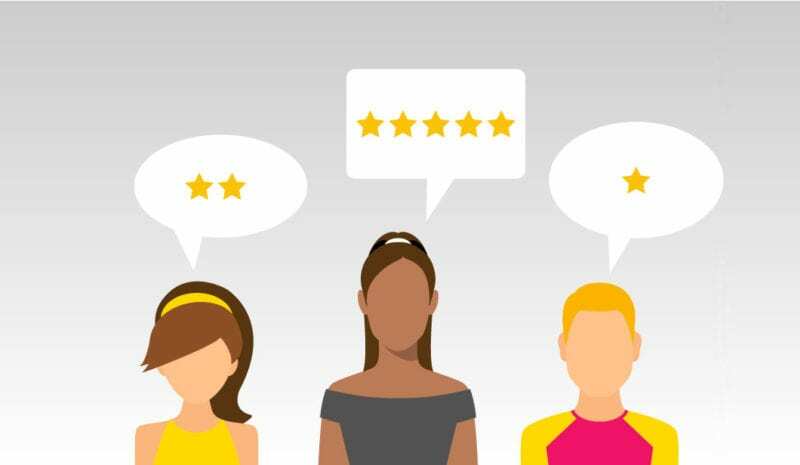 Studies show that 31% of customers are likely to spend more on businesses with positive reviews, so you want to hoard these icons and communicate a positive online reputation to everyone searching for your company, products or services. With millions seeking reviews on Google, setting up your business for success with Google is particularly important. Their 5-star rating appears right on the search page. Consumers don’t have to visit Yelp or another review site. Your company reputation is thrust front and center, and your bottom line will be affected by the number of Google stars you have under your name. The website Marketcharts states that overall star rating remains the most important factor for consumers when judging a local business on its reviews. Google shows the consumer stars before they even click through to your website. Google also pays attention to your star rating. The more stars you have, the higher you will rank when consumers search for your products and services. Good reviews are not luck. All those companies with high ratings and hundreds of positive reviews didn’t get them by chance. A positive and prolific company reputation is the result of a smart marketing strategy. You can offer the best products and services in the world, but this will not help you generate business online if you are not spreading the virtual word and developing a stellar online presence. ACS recommends a two-fold approach to generating more online reviews. Step one: The first part of your online marketing plan is building a website that is modern, responsive (meaning it automatically adjusts to mobile and desktop viewing) and makes consumers feel good about your company. A dated-looking website that does not work well or makes information hard to find will be a ding on your online reputation. This is no different than having a messy store or slow service at your restaurant. The appearance and functionality of your company’s website will influence both your sales and your future reviews. Cultivate a feel-good customer relationship. Great product/service + well-designed site + skilled email marketing = positive reviews. Oops, got a bad one. Unfortunately, negative reviews happen even to the best of companies. Fortunately, here’s the real advantage of online reviews: you can respond to negative ones. Unlike before when you had no idea if someone was verbally trashing your company’s reputation, these days you can reply to the upset customer—and it is important to reply. Keep in mind that your response is not just for them. It’s for everyone reading the review. If you let the negative review go unanswered, potential customers won’t know if your company stands by its products and services. You may never be able to satisfy the writer of the negative review, but you can sure let the world know that you tried—and this is critical to managing your company reputation online. Plus sites like Yelp and others do monitor reviews. You can request that a particularly vicious and unfounded review be removed. It is important to have a marketing strategy for dealing with negative reviews promptly. Let ACS develop a marketing strategy for managing your company reputation online. We have the skills and the savvy to spread the word-of-internet.